Naturvet Glucosamine DS Liquid with MSM & Chondroitin helps to maintain joint flexibility and alleviates aches and discomfort associated with exercise. 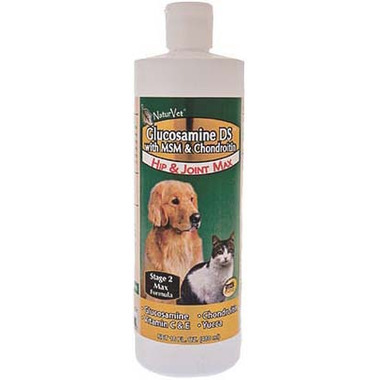 This liquid also contains important antioxidants that help protect against cellular damage in your pet. Show your best friend some love by supporting healthy hip and joint function with Naturvet Glucosamine DS Liquid with MSM & Chondroitin. Active Ingredients (Per 1/2 Teaspoon): Glucosamine HCl (Shellfish Source) (750 mg), Methylsulfonylmethane (MSM) (750 mg), Yucca Schidigera (135 mg), Ascorbic Acid (Vitamin C) (135 mg), Chondroitin Sulfate (Bovine Source) (90 mg) and d-Alpha Tocopherol (Vitamin E) (5 IU). Inactive Ingredients: Citric Acid, Corn Syrup, Deionized Water, Methylparaben, Natural Flavoring, Potassium Sorbate, Propylparaben, Sodium Ascorbate, Sodium Benzoate and Xanthan Gum. Always follow the instructions attached to the label of this product!